D.C. police released video Wednesday showing the man who stole an SUV from a Maryland gas station with an unattended baby still inside. The baby was found safe in D.C., just across the border, but the SUV is still missing, and at least one suspect is sought. Footage of the frightening crime Tuesday shows an SUV stopped in the 5600 block of Eads Street NE. It rolls forward, perhaps after the driver forgot to put it in park. A man in a black-and-white jacket gets out of the driver's seat, walks around to the rear passenger-side door and appears to struggle with a car seat. Police use a time lapse effect to show the length of time the man stood at the side of the car. 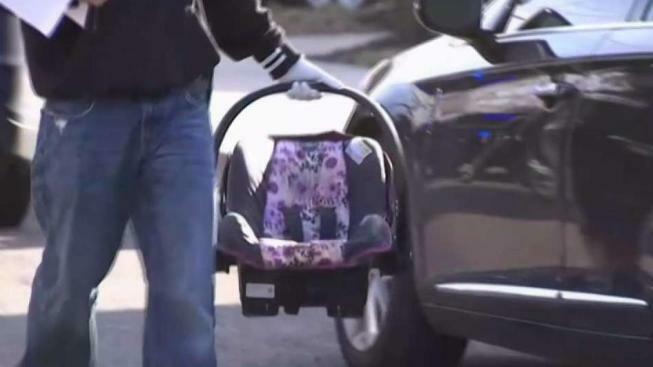 The video doesn't show him removing the 1-year-old girl still in her car seat. But he can be seen closing the rear door and rushing back to the driver's seat. He speeds around the corner and disappears. Two good Samaritans saw the baby right away and rushed to help her. D.C. police classified the crime as a second-degree cruelty to child incident. Anyone who sees the suspect or the dark gray 2013 Chevrolet Traverse with the Maryland license plate 4CM8301 is asked to call police. The SUV was stolen with the baby inside after the child's mother went inside a gas station in Seat Pleasant. The vehicle was stolen seconds later, Seat Pleasant police said. Police are searching for a dark gray 2013 Chevrolet Traverse with the Maryland license plate 4CM8301. 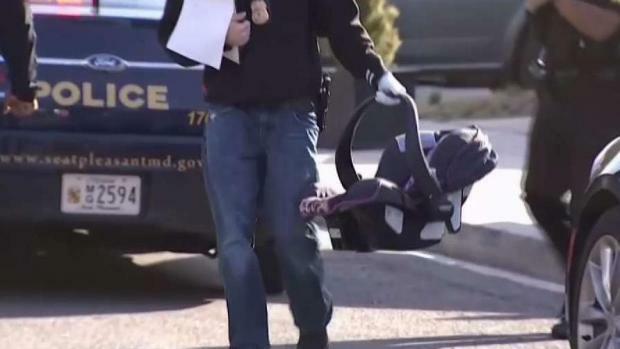 News4's Tracee Wilkins was first on the scene after a baby was abducted inside a stolen car in Maryland. A gas station worker told her how the child's mother reacted. 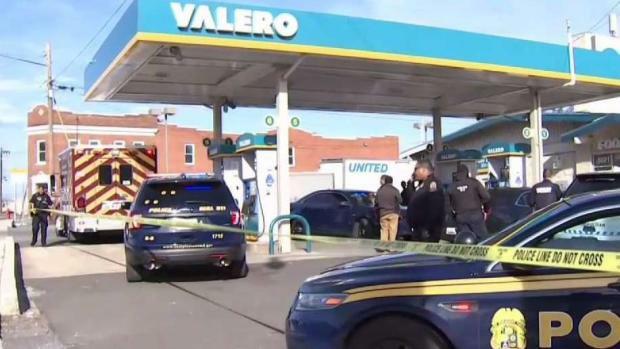 The SUV was taken from the Valero station in the 5600 block of Martin Luther King Jr. Highway. Police were called at about 2:45 p.m. The child's mother got out to go into the gas station's store, leaving the little girl in the SUV with the engine running. While she did, two strangers jumped into the unattended vehicle and drove off, Seat Pleasant Police Chief Devan Martin said Tuesday. A gas station worker said he saw it happen. "The guy, he just jumped into the car and run the car," he said. He asked News4 not to reveal his identity. The mother was horrified, the worker said. Police are searching for a dark gray 2013 Chevrolet Traverse with the Maryland license plate 4CM8301. This is a file photo of a Traverse, not the exact vehicle for which police are searching. "She cried a lot. She was like, mad. She was not able to talk," he said. Seat Pleasant police were about to put out an Amber Alert, and notified Prince George's County police and D.C. police of the search. But then they got a call about a baby found in a car seat. Two women who work at a funeral home about a half-mile northwest, at 57th and Eads streets in Northeast D.C., saw the baby. Brianna Dunne and Grace Murray said they went to the window because they heard loud music. They said they saw the SUV stop, someone take out the car seat and drive off. They raced downstairs to help. "We jumped over everything," Murray said. "Flew down the steps. I probably missed five or six steps." "She did. I thought she was Superwoman," Dunne said. A mother went into a gas station, leaving her baby in her SUV, and the vehicle was stolen. The child was quickly found, but the search for two suspects and the vehicle continued Tuesday evening. News4's Tracee Wilkins is on the scene. They called police, and officers rushed to the child to reunite her with her mother. She and the child were evaluated by medics and were OK.